Litchi cultivation has brought smiles to hundreds of farmers and traders at many villages in the district, with a bumper yield of the juicy summer fruit this season. Litchi growers at Jahapur village of Madhukhali upazila said they are very happy with this year's output and farming of this seasonal fruit has changed their fate. He also predicted that farmers in the district will bag around Tk 1.15 crore to TK 1.30 crore by selling litchi this year. The villages that saw bumper yields are Jahapur, Daptardia, Tengrakandi, Monohardia, Char Monohardia, Kharakandi and Mirzakandi villages of Madhukhali upazila and Chandpur, Chatarbazar Kandi in the Sadar upazila, according to sources at Department of Agriculture Extension (DAE). “Litchi was cultivated in over 22 hectares of land in Jahapur village alone,” DAE agricultural officer Nadira Akhter told the UNB correspondent adding that litchi ranks 12th among 819 types of fruits produced in the region. “Litchi was cultivated in around 1,195 hectares of land last year,” she added. According to villagers at Jahapur, a zamindar (land lord) of Madhukhali had imported a litchi tree from India’s Madras around 300 years back. After the abolishment of zamindari system, locals, including Abdul Sattar Sheikh, Sultan Ahmed, Shahjahan Mollah and Bazlu Mallik carried on the tradition of litchi cultivation and became financially wealthy by selling those. Although commercial production has been ongoing in the region for over 50 years now, the farming gained momentum in the last 10-12 years, they added. Locals said previously litchi used to be cultivated along with other crops, but due to the rise in labour wages, farmers in the district are focusing on litchi farming as it costs less than other crops. Different varieties of litchis, including Bombai, Bedana, Veri, and China-3, are more popular among the farmers. Mozaffarpuri is famous as it is produced here in great number as well as big in shape and the seed is moderately smaller, apart from being the most sweet and delicious from the rest. Litchi farmers said they began preparing their land during the Bangla months of Ashshin and Kartik (September to November). Later, from Ashshin till Baishakh they have to spray pesticides at least for six times. 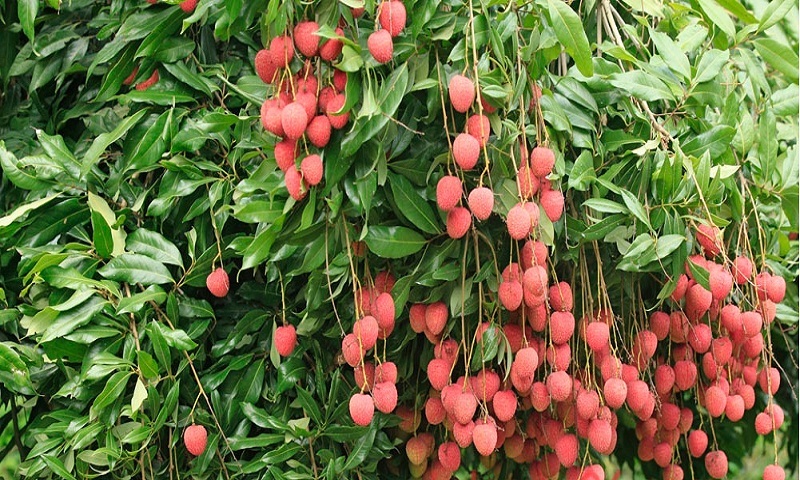 Once litchis are bloomed, those cannot be left on the trees for long, as they have to be extracted and sell within 10-12 days of blooming, they added. The last two years were fierce to the farmers as intense hailstorms and incessant rain damaged litchis, resulting in low yields, but this year the farmers are hopeful of seeing a good profit.